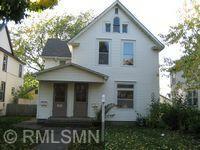 Warm and cozy duplex in vibrant Northeast Minneapolis with easy access to all neighborhood amenities. This is a great opportunity to live-in one unit and have your already in-place tenant pay for part of your mortgage or simply a great investment opportunity! Existing tenants have been in the units for many years and are on a month-to-month lease at below-market rent. Directions - 2 blocks south of Lowry and 2 blocks west of University.